My name is Ms. Rainwater and I am very excited to be your sixth grade teacher. I would like to tell you a bit about myself. This will be my first year teaching. I spent 15 years in the automotive industry before following my dream of becoming a teacher. 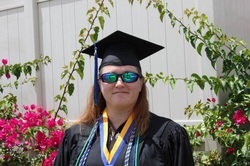 I graduated from Florida Gulf Coast University with my Bachelor of Arts in Education with a focus on secondary social sciences. I love history and science and together we will learn a lot about both of those subjects. I am originally from North Carolina and relocated to Cape Coral in 2007 with my fiance, Ben, and my two children, Marshal and Morgan. We still live in Cape Coral with our two dogs, two cats, and fish. This school year will be very exciting and I have lots of fun activities planned that go with our STEM (Science, Technology, Engineering, and Math) focus that I know you will enjoy. We will also work on a number of projects that will help us understand ancient civilizations as well as predict how the future may look. As we get ready to begin this school year let's agree to all do our very best. Your hard work will be rewarded with pride in yourself and good grades. Your success will be my reward. I know we are going to have a terrific year!